And yes, I have more colors available in my Etsy shop. 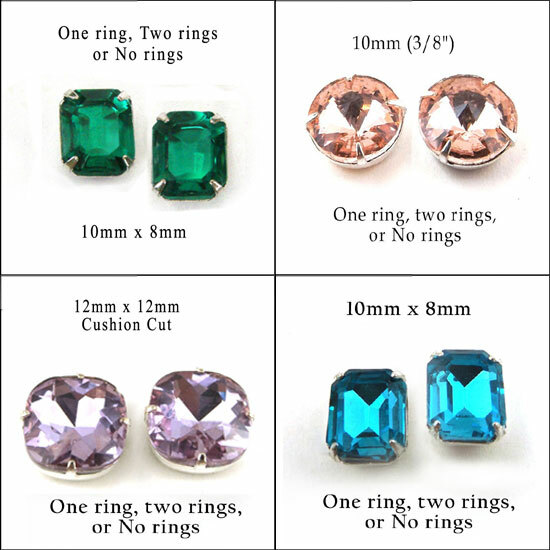 Or just ask, if there’s a color and shape you’re looking for – I might have it, or know where to find it. 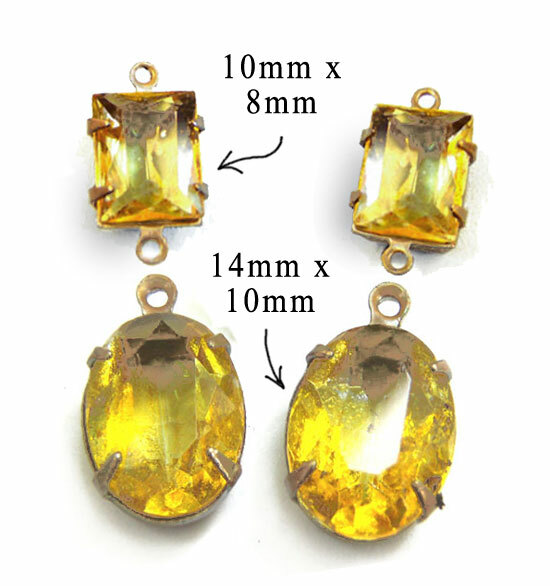 I just wanted to show another quick example of how combining rhinestones and simple charms can make stunning earrings. You don’t have to fuss for a long time! Or spend a lot of money. See? This is not a new idea or anything, it’s just a fun example of what you can do. A bit of color – a bit of silver or gold. 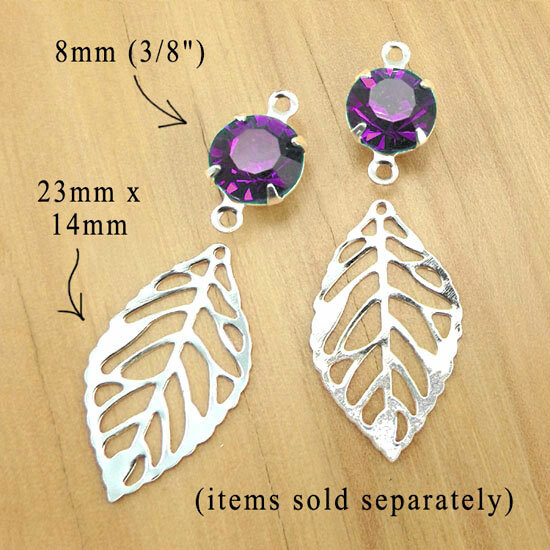 Link these with simple jump rings, add an earwire, and you’ve got a lightweight, pretty dangly earring. You know I think vintage is just the best. And this dress is a terrific example of why. You could wear it anywhere, you could work or play. You could meet his mom in it, you could go shopping with your buds, and you would look right each time. I mean, that’s not easy to do. See what I mean? This dress is EASY. It looks like something you could just toss on, don’t think about it for a minute. Grab some shoes – high heeled sandals, or flip-flops. Or little ballet flats. Whatever. Add a pair of earrings (not that I’m biased towards earrings or anything) and you’re done, dressed, ready to go anywhere and look good. Okay, maybe add an armful of bangle bracelets. I found this darling dress at ShopBTMV on Etsy. The shop’s only been open for a year, and already there are some great finds, fab dresses, and vintage accessories too if that’s your thing. Go shopping. You’ll thank me. PS There’s a black velvet grunge backless maxi dress that if it was my size? It would be gone already. Just saying. This is a design I love – and my customers have been pretty happy with it too 🙂 These crystal (glass) octagons are pointed back cabochons, glass jewels that measure 14mm x 10mm (approx. 5/8″ x 3/8″). 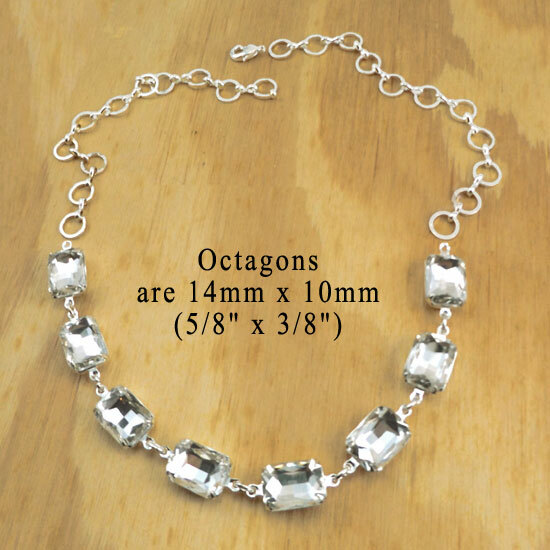 They’re well faceted, sparkly, and feminine. And here’s the even-cooler part. 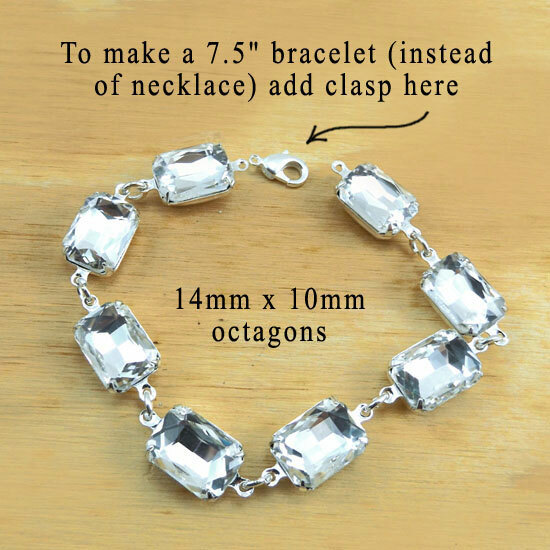 Take this same basic design, and instead of adding silver(y) chain, attach a clasp. Double sparkly goodness for your prom, your Saturday night date… or your wedding. Win! 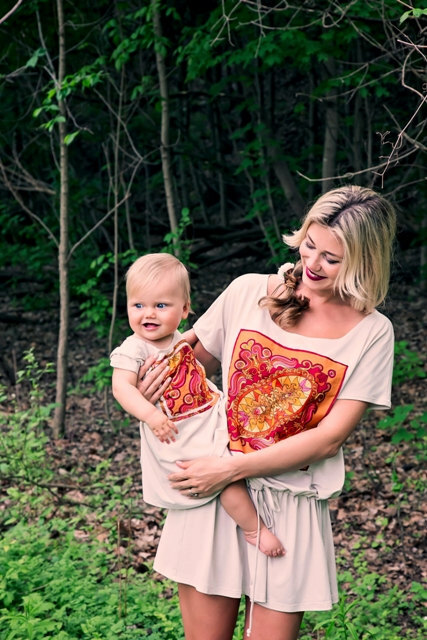 Mother and Daughter dresses – a great Mother’s Day gift! You know Mother’s Day is coming up – and I just lucked into finding these totally adorable, matching mother’s and daughter’s dresses at NaforA on Etsy. The thing is, they are not only cute, and handmade, but they are versatile and actually wearable. They can be summer dresses “as is”. They can be winter tunics, with leggings and maybe long-sleeve tees underneath. The mom’s dress is not tight – you can use it as a maternity dress! Or a great-looking “I’m not feeling skinny today” dress. And be cute at the same time! The shop owners, Halyna and Natalia, are a mother/daughter team themselves. They’re doing a bit of an update on their shop – and I think we’re going to love what they come up with. Go see for yourself! I haven’t done an “Etsy Mini” in a while – that’s sort of a snapshot, of some of the items currently available in my Etsy jewelry supplies shop. Here, take a peek! That’s just a few of the 300 items I’ve got in my shop right now. And also – if there’s a glass jewel, maybe a color or shape you’re looking for and can’t find – just drop me a note. I might have some, or know where to find them. I’m specially interested in the hanging displays. You could use those on your dresser – or adapt them for craft shows. Versatile and cheap and could be very cool! Kudos to Karen’s Thrift Store Challenge and HGTV Handmade for these ideas! And a special thank-you for the idea of getting your supplies from thrift shops, so you’re inventing cool jewelry displays – and recycling and reusing – at the same time! As much as I love color, crystal jewels are always in style – and they always look good! Year round, day or night, a subtle small jewel or a bold chandelier or, well, you name it. Crystal is faceted glass and those facets reflect light, bringing sparkle and light to the person who’s wearing it. Brides love them because they add a glow and touch of luxury to that very special day. Prom queens love them. I love them. You love them. Let’s get real – sparkle is fun. It looks good. 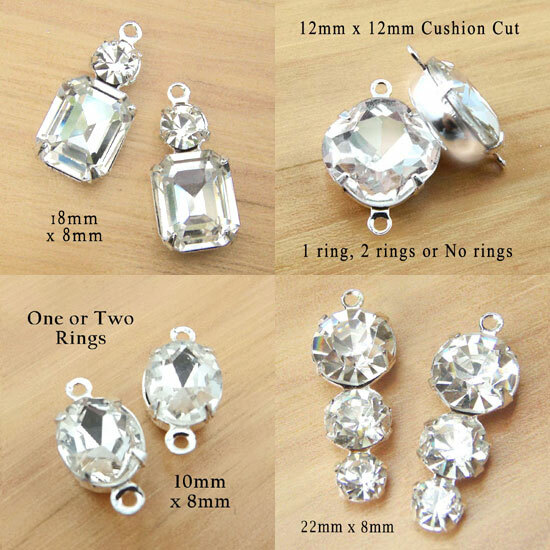 And in honor of April’s birthstone, these “glass diamond” crystal jewels have an added bonus – buy three pairs of crystal (white, clear, “diamond”) glass jewels in my Etsy jewelry supplies shop – any size or style – and you get a free gift. All you have to do is mention this blog post. The offer’s good all month, till midnight April 30, 2016.